The star studded beauty and entertainment gala extravaganza saw the crowning of Priya Patel from Alabama & Saavan Patel of California as Mr. & Miss India America 2015 held at the Renaissance hotel in Los Angeles, CA on August 8th. This year marked the 23rd anniversary of the international phenomenon, Miss India America beauty pageant, presented by South Asia Magazine, Mera TV, JINmodels.com, Bodvar of Sweden. Created by Jinnder Chohaan, she’s eminently known to have been the first to create a Mr. India pageant in the world (five years before India). The evening began with an amazing group of prominent personalities from all over the world walking down the red carpet, these included: actress Annett Mahendru (The Americans), actor Tyler Olson (The Prince, Vice, Jarhead), Supermodel Katie Cleary (cover girl for South Asia Magazine), Hollywood producer Sunil Perkash (Salt, The Enchanted), actor Ken Davitian (Borat), Bravo TV’s Asifa Mirza (Shahs of Sunset), actor Ravi Patel (Grandfathered), model & TV host Jessa Hinton, model/actor Sam Asghari, Screenwriter Bill Kelly (Premonition), actor Asif Ali (Mr. Robinson) Australian singer Katja, actress Nishi Munshi (CW’s The Originals), actress Wedil David (Valentine’s Day), and many others. With many of the pageant’s past winners making it in Hollywood, its no surprise that Priya was thrilled.– Melanie Kannokada, former Miss India America, can be seen on HBO’s ‘The Brink’ with Jack Black and Tim Robbins, and soon on CBS new TV Series ‘Code Black’ in September. Nishi Munshi, former Miss India California, can be seen on CW’s ‘The Originals’, and Hasan Minaj, former Mr. India California, is seen as a regular on ‘The Daily Show’ with Jon Stewart. In the Mr. India American 2015 portion, we saw accomplished Bharat Natyam dancer Saavan Patel take first with Mr. India America 2015 and the very handsome Joseph Berg grab the Mr. South Asia 2015. The other Miss India title winners that night were: Heart Hayes (Miss India Globe 2015), Mayuri Bhandari of Nevada (Miss India Global 2015), Gurleen Kaur (Miss India Galaxy 2015), Jasmine Mann (Miss India North America 2015), and Neeru Sehgal (Miss India California 2015), Tamana Khan (Miss South Asia USA 2015), and Parul Berry (Beauty of India 2015). For the Mr. India winners: Rohit Agarwal of Minnesota (Mr. India Globe 2015), Prem Rahman of Georgia (Mr. India Global 2015), Saksham Ghai (Mr. India Galaxy 2015), Dilip Reddy of Pennsylvania (Mr. India North America 2015), and Paul Perumal (Mr. India California 2015). Along with the pageant, THE ELITE AWARDS were held that honored those that have excelled in the entertainment industry and have inspired others. THE ELITE AWARDS 2015 honored today’s top Hollywood producers: Randall Emmett (Lone Survivor, 2 Guns, Escape Plan, Rambo) and Adi Shankar (Broken City, Killing Them Softly, The Grey). When asked how they felt about the evening, Randall expressed that it was truly, “Magical”, while Adi Shankar stated, “I’m having a great time”. Randall Emmett's blockbuster hits included: Lone Survivor w/ Mark Wahlberg, 2 Guns w/ Denzel Washingon, Empire State w/ Liam Hemsworth, Escape Plan w/ Sylvester Stallone, 16 Blocks w/ Bruce Willis, and Rambo w/ Sylvester Stallone. Adi Shankar's blockbusters include: Killing Them Softly w/ Brad Pit, Broken City w/ Russell, and The Grey w/ Liam Neeson. While all the contestants and guests made the event spectacular, it was truly made possible by event sponsors: Robert Mondavi winery, PrintLife, Belvedere Vodka, People Water, Brain Toniq, Domaine Chandon, Patron, Scala, Top Priority Media, and Cloud 21. The show will be aired on Star Plus TV, be sure to email info@SouthAsiaInc.com to get details on the show’s airing date and time. Judges for the pageant were: actress Annett Mahendru (The Americans on FX & The Following on Fox), Supermodel Katie Cleary (cover girl for South Asia Magazine issue revealed that night), actor Ken Davitian (Borat), Bravo TV’s Asifa Mirza (Shahs of Sunset), actor Ravi Patel (Grandfathered), model & TV host Jessa Hinton, model/actor Sam Asghari, actor Asif Ali (Mr. Robinson) actress Wedil David (Valentine’s Day), Sony Pictures VP David Ducar. Mr. & Miss India America 2015 is presented by South Asia Magazine, Wells Fargo, and JINmodels.com. The star studded VIP fashion, beauty and entertainment gala extravaganza will see the crowning of Mr. & Miss India America and the honoring of those that have excelled in entertainment during The Elite Awards to be held at the Renaissance hotel in Los Angeles, CA on August 8th, 2015. It is that time again where we witness the official crowning of Miss India America 2015. The year marks as the 23rd anniversary for the beauty pageant. Founded in 1992, by Jinnder Chohan, the pageant has grown to become an International phenomenon. 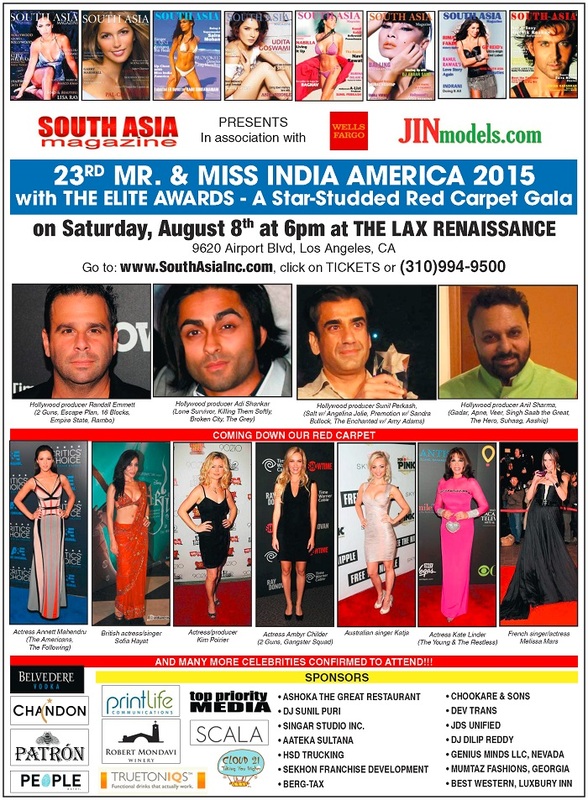 Mr. & Miss India America 2015 is presented by South Asia Magazine, Wells Fargo, and JINmodels.com. With the pageant’s impressive reputation, the gala has become a connection of fashion, beauty and media under one roof. The pageant will be on Saturday, August 8th at the LAX Renaissance hotel (9620 Airport Blvd., Los Angeles). Celebrity red carpet arrivals begin at 6pm, followed by dinner (catered by Ashoka the Great Indian Restaurant), show and celebration party with DJ. The Mr. & Miss India America pageant will be an amazing cultural experience with glamour and entertainment, displaying Indian beauty and talent on a mainstream platform. International media will cover the red carpet arrivals. Creator Jinnder Chohaan declared, “Bollywood filmmaker Anil Sharma of hit films: ‘Gadar’, ‘Veer’ & ‘Apne’ will be one of the official judges at Mr. & Miss India America. We are also honored to have Hollywood producer Sunil Perkash of hits: ‘Salt’ with Angelina Jolie and ‘Premonition’ with Sandra Bullock joining us at our pageant." THE ELITE AWARDS 2015 will honor today’s top Hollywood producers: Randall Emmett and Adi Shankar. Having worked with top A-listers in Hollywood, Randall Emmett's blockbuster hits included: 2 Guns w/ Denzel Washingon, Empire State w/ Liam Hemsworth, Escape Plan w/ Sylvester Stallone, 16 Blocks w/ Bruce Willis, and Rambo w/ Sylvester Stallone. Adi Shankar's blockbusters include: Lone Survivor w/ Mark Wahlberg, Killing Them Softly w/ Brad Pit, Broken City w/ Russell, and The Grey w/ Liam Neeson. THE ELITE AWARDS honors those that have excelled in the entertainment industry and have inspired others, past recipients have included: Hollywood legend Garry Marshall (Pretty Woman), actor Steven Seagal, director Shekhar Kapur, Bollywood filmmakers - Anurag Kashyap, Kunal Kohli, Subhash Ghai, Rahul Rawail, etc. Many of the pageant’s past winners are making it in Hollywood – Melanie Kannokada, former Miss India America, can be seen on HBO’s ‘The Brink’ with Jack Black and Tim Robbins, and soon on CBS new TV Series ‘Code Black’ in September. Nishi Munshi, former Miss India California, can be seen on CW’s ‘The Originals’, and Hasan Minaj, former Mr. India California, is seen as a regular on ‘The Daily Show’ with Jon Stewart. The evening will begin with an amazing group of prominent personalities from all over the world walking down the red carpet, these include: actress Ambyr Childer (2 Guns, Gangster Squad, Showtime’s Ray Donovan, NBC’s Aquarius), actress Annett Mahendru (FX’s The Americans, The Following on FOX), Bravo TV’s Asifa Mirza (Shahs of Sunset), Bollywood's DJ Akbar Sami, actor Ravi Patel (Grandfathered with John Stamos), actress/producer Kim Poirier, actress Kate Linder (The Young & The Restless), Australian singer Katja, French singer/actress Melissa Mars, British singer/actress Sofia Hayat (Big Boss), actress Nishi Munshi (CW’s The Originals), actress Courtney James Clark (Jurassic World), BET TV host Chasity Saunders (The Art of Fabulous), Disney singer/actress Alexa Ferr, Dr. Rachael Ross (Doctors), Tyree Washington (Gold Olympian and former San Diego Charger), actor Joe Estevez, Karla and Iris Gordy (MoTown Records), actress Madison Beaty (The Fosters), Rizwan Manji (The Wolf on Wall Street), and many others. Event sponsors include: Robert Mondavi winery, PrintLife, Belvedere Vodka, Top Priority Media, Cloud 21, People Water, Brain Toniq, Domaine Chandon, Patron, Scala, and Bodvar of Sweden.